Well, that was much more like it. Borussia Dortmund might be struggling in the Bundesliga, but they remain a team packed with individual quality. A 2-0 win is undoubtedly something to celebrate. A lot was made of the difference between our performance against United and Dortmund. In reality, I think the biggest differentiator was the opening goal. Had we not scored in the first couple of minutes, there’s nothing to say we wouldn’t have gone on to attack with the reckless abandon we did against United. Had we gone behind… well, it doesn’t bear thinking about. Nevertheless, it’s still good to focus on the positives, of which there were many. Arsenal’s main stars were the understudies: Emi Martinez and Yaya Sanogo shone in the absence of Wojciech Szczesny, Olivier Giroud and Danny Welbeck. Sanogo’s goal does not thrust him in to regular first-team contention, but it does get both a monkey and the fans off his back. Arsenal being Arsenal, the elation didn’t last long. Within minutes of the full-time whistle, Arsene Wenger had confirmed injuries to both Sanogo and Mikel Arteta. The following day, news broke that Jack Wilshere had undergone surgery that will see him miss the next 3 months. It’s hard to feel surprised by a prolonged Wilshere lay-off anymore. It’s like death, taxes or Robbie Savage saying something stupid: it just happens and there appears to be little anyone can do about it. It was a poor challenge from McNair, and few would have survived it unscathed. However, I do wonder if Wilshere’s tendency to hold on to the ball too long invites such clatterings. His bravery on the ball is admirable, but costly. Something for him to contemplate during his lay-off, perhaps. The Wilshere news rather pulled the rug of positivity out from under our feet. I suspect that’s a feeling we may have to get used to this season. Personally, I’m just taking it a game at a time. With the Premier League title beyond us, it’s already tempting to view this as season as a write-off. That’s a horribly depressing outlook. I find the only way to avoid that is to embrace the present and try to enjoy the ride. Go from game to game, savour the wins, and keep your eyes on the immediate foreground rather than the horizon. There may not be anything for us in May, but that doesn’t mean we shouldn’t aspire to deliver some memorable moments along the way. Decided to keep a video record of my evening at the Emirates. Enjoy watching it steadily unravel. Well, that was very enjoyable indeed. I’m on holiday at the moment, so forgive me if this entry is a little shorter than usual. It hasn’t been the subject of much discussion, but Yaya Sanogo has missed every Arsenal match since transfer deadline day with injury. Had Welbeck not been secured at the 11th hour, Arsenal would have been strikerless for the entire month of September. I felt Welbeck had enjoyed a solid enough start to his time with us. Last night, however, his Arsenal career exploded in to life. The England international notched the first hat-trick of his career to dispatch Galatasaray and earn us our first three points of the Champions League campaign. After the Tottenham match, Wenger insisted that if our collective game was good then Welbeck would score. That hypothesis was validated last night, with Welbeck flourishing at the point of a slick Arsenal attack. Welbeck is fast. Faster, it transpires, than any of us – including Arsene Wenger – initially thought. Ever since Welbeck signed, we’ve wondered how we might terrify defenders by partnering him with the equally quick Alexis and Walcott. Last night, we got an idea, with Alex Oxlade-Chamberlain performing admirably as Theo’s understudy. Welbeck’s second goal was the one that sticks in the mind. Latching on to a loose defensive header, he raced away from his marker, showcasing speed and muscularity, before opening up his body to sidefoot in to the far corner. There was an audible gasp from the Emirates Crowd. For a split-second, the Arsenal fans thought they had seen a ghost. He’s not yet at a level where he can produce this kind of performance every week. However, it’s a glimpse of what he can produce. It’s not what he is, but it’s what he might be. It’s very exciting. In the week Olivier Giroud agreed a deserved new deal, Welbeck delivered a devastating demonstration of why I believe he could be a superior option as our centre-forward. …who’d have you believe that our victory was down purely to Galatasaray’s incompetent. I’ve seen us fail to beat plenty of incompetent sides in the past – last weekend, for example. This win is significant because it was one of the few times this season that Arsene got our attacking alchemy right. The combination of pace up top and Ozil central is something we need to stick with. Wojciech Szczesny’s sending off was silly. He didn’t need to go charging out at the feet of the attacker in such reckless fashion. Tempting as it is to come down hard on Szczesny’s impetuous nature, it’s worth remembering that the great Jens Lehmann was guilty of similar moments of madness. That didn’t stop him remaining first-choice keeper throughout the unbeaten season. The best goalkeepers are often slightly eccentric. The balance between talent and temperament is a difficult one to find. Over the past month, The Ox has played himself in to the first XI. He is an example to any player currently out of favour. He made a positive impression with a series of energetic cameos, and when handed the opportunity to start games has made himself undroppable. Lukas Podolski & co could learn a thing or too from that. Arsenal were dreadful against Dortmund. Watching this felt like looking at a cruelly-drawn caricature of a bad Arsenal display. Jurgen Klopp’s team were outstanding, and had us on the back-foot for 90 minutes. That said, I feel like I’m a little more positive than most in the wake of this match. I think it’s because I saw encouraging signs against City that I’m not prepared to write off on the back of one horrendous night. There’s a certain novelty about our squad. We’ve got some shiny new toys to play with, and until they’re settled in I’m refraining from definitive judgement. I can understand the frustration and anger that envelops the Arsenal fanbase this morning. Arsene Wenger might have loosened the purse strings, but he doesn’t seem to know how to tighten the defence. It’s the repetitive nature of these defeats that’s so infuriating. Wenger’s team make the same errors time after time, marching lemming-like towards high-profile defeat after high-profile defeat. It’s tempting to wheel out the same blog as I do after each of those loses, citing a lack of defensive discipline and the absence of a powerful holding midfielder. To be honest, talk of missed signings feels like a bit of a red herring. The problem is as much to do with tactics as transfers. Still, I’m optimistic. We haven’t yet hit form this season, but oddly I find that reassuring. I feel like there’s a good XI in our current squad, but Arsene is yet to achieve the alchemic balance to see that translate on to the pitch. It must be true that the best is yet to come. It’s a dirty word but we’re a team in transition. We’ve had that label in the past when coping with the loss of a major star. That wasn’t transition — that was recovery. This time, the change has been instigated deliberately, not forced upon us. In signing Alexis and Welbeck, Wenger has indicated an intended shift in style. He wants us to a play a more intense pressing game. He wants us to use our speed to win the ball high up the pitch, long before it reaches that dreaded defensive midfield area, and punish opponents with rapier counter-attacks. In short, he wants us to be more like Dortmund. That kind of strategic shift takes time to implement. We lack fluidity and we lack balance. Both will come with time. We can’t wait forever. Transition is only bearable if it arrives at a decent destination — none of us want to watch much more of this purgatorial pish. Call me crazy, but I think someone will be on the end of a hiding when this team eventually clicks in to gear. Let’s hope it’s Villa this weekend. I cannot understand why a manager as ethical and principled as Arsene would go near a player like Suarez. I cannot fathom why our great club would seek to harbour a footballing fugitive. The situation is made all the more bizarre by the apparent availability of the talented and seemingly decent Gonzalo Higuain, who is now edging towards a move to Napoli. It’s genuinely baffling. Arsenal paying £40m for a player is something I hoped I’d see one day. However, the sight of Luis Suarez in an Arsenal shirt is something I still hope I’ll never see. Blowing that sum on a player who will be dogged by suspension and controversy is lunacy. What’s more, Suarez has a proven track record of forcing transfers every couple of seasons. If he joins us, he’ll view us merely as an escape raft until he can leverage a move to Real Madrid. A new season ought to feel fresh. It ought to be a new start. The manager ought to enter the new campaign free of the pressures of the last. However, Arsenal’s disastrous summer has put Arsene Wenger under considerable strain before a ball has even been kicked in anger. If Arsenal fail to beat Aston Villa today, the Emirates will resound with the boos from fans who will understandably feel they have been misled. They were promised statements of intent and a change in policy. Instead they’ve suffered more of the same penny-pinching and indecision. I had a vision of a better Arsenal. It was a vision sold to me by Ivan Gazidis, who promised me that after a decade of harsh desert we were approaching an oasis of plenty. It was a vision that sustained me through a summer starved of football. It was a vision that I, somewhat foolishly, believed in. And it was just a mirage. The dream evaporated and condensed in to the cold wet reality of a 3-1 home defeat to Aston Villa. Some dream. Some start. It’s amazing what a difference confidence can make. The way he took his second goal was the mark of a player who has absolute faith in his ability at the moment. Having gone through a process of simplifying his game and bringing it back to basics, Ramsey is now supplementing his hard work with the flair he patently possesses. His progress is exciting. Arsenal are being linked with moves for Karim Benzema, Mesut Ozil and Angel Di Maria. All three would add a huge amount to the Arsenal squad, but only the latter seems remotely probable. Madrid seem unlikely to sell Benzema and Higuain in the same window, while Ozil is likely to also be a target for Manchester United. That is not a tug of war I’d fancy us to win. Ozil would be a game-changing signing. Assuming it goes ahead, it’s massive. I would never have believed that we’d be capable of recruiting a marquee talent of this level. However, while I hate to gripe on what is a undoubtedly momentous day for the club, I’m staggered that Arsenal are going to go in to the season with Olivier Giroud as the only senior centre-forward. Giroud was superb against Spurs, but by the end of the game was exhausted. It’s a feeling he’ll have to get used to in the coming months. There’s no doubt it’s a transformative signing, and the most significant since the arrival of Dennis Bergkamp in 1995. 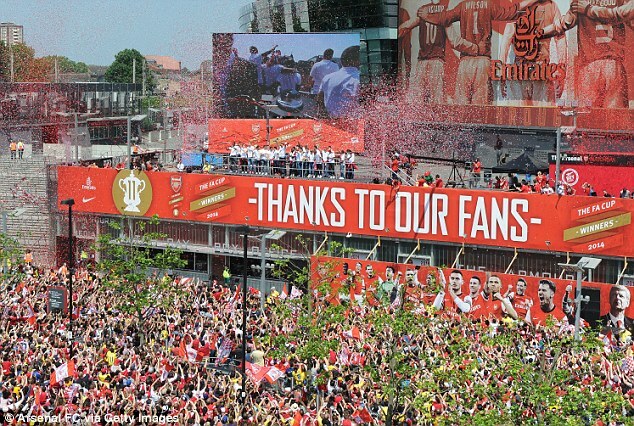 When it was announced half an hour before the window’s close last night, Sky’s Geraint Hughes noted that the Arsenal fans’ jubilation was due to the fact they’d waited all day for a signing like this. The reporter were wrong: we’ve waited for more than a decade. Just a few hundred yards separate Highbury and the Emirates, yet the Ozil deal feels like the completion of an arduous ten-year journey. However, it must be not only an ending, but also a new beginning. This has to be the start of something. …and Mesut Ozil is undoubtedly a great player. Seeing him step out on to the pitch in an Arsenal shirt was both surreal and sublime. His touch was immaculate and his passing incisive. Considering he had barely trained with the team, his immediate rapport with the likes of Wilshere, Ramsey and Walcott was remarkable. Confidence is an extraordinary thing. It can do incredible things to a footballer. Ramsey is at the crest of a wave, and I hope he can stay there as long as possible. When he inevitably reverts to somewhere approaching the mean, I still think we’ll still have a very fine footballer on our hands. The ball arrives on Wilshere’s right foot, and he places a perfect volley in to the far corner. No power is needed. The finish, like the rest of the move, is all guile and grace. When he sees the ball hit the net, he allows himself a roar of exhalation. He knows it’s special. The Arsenal fans do too, reacting with an upwardly-inflected combination of awe and disbelief. And he keeps going, jogging towards the fans before sliding on his knees in celebration. Wilshere finally rests. 20.34 seconds, five players, nine passes, and 28 touches have come together to create one masterpiece. Arsenal fans waited for six weeks to see Santi Cazorla and Mesut Ozil play together. Thus far, the combination has failed to live up to its understandably starry billing. Our next four fixtures see us face off against Chelsea, Liverpool, Dortmund and Manchester United. This clash with Palace was all about getting three points – by any means.It’s often said that winning while playing poorly is the mark of a title-challenging side. I’ll hold off from such proclamations until we are able to assess Arsenal’s performance in the difficult games ahead. Arsenal face a crucial Champions League tie with Dortmund this week, but I’d gladly swap victory in Germany for three points at Old Trafford next Sunday. The Premier League campaign feels all-encompassing and all-consuming. The irritation felt at dropping out of the League cup was banished by beating Liverpool. Arsenal are currently five points clear. There is a growing sense that Arsenal can mount their first serious and sustained title challenge since 2007/08. Nothing – not even European progression – would excite me more. Wenger has always been something of a perfectionist. This season, he has shown he is prepared to be a pragmatist too. His perfectionism is no longer confine to Arsenal’s aesthetic dimension, but seems to encompass a broader appreciation of the games. Whereas once he was cavalier, he is increasingly practical. He seems to take pride in the team’s defending once more. He’ll have been just as satisfied by the clean sheet as the three exquisite goals. If anyone looked likely to make the breakthrough for Arsenal it was Ozil. His last three performances have all been right out of the top drawer of football’s tallest cabinet. When he smartly lifted the ball over Tim Howard and in to the roof of the net, it really felt like we might be watching a defining goal in the Premier League season. A buoyant stadium was silenced by a smashing strike from Gerard Deulofeu. Some have criticised Szczesny for failing to stop the shot, but it really was an excellent hit. It flashed past the Pole and evaporated our hopes of that seven-point lead. Gutting, but probably fair. Having been roundly trounced by City, it’s tempting to wonder just how costly that Gerard Deulofeu goal last week might prove to be. Arsenal’s cushion has disappeared and our seat at the top of the table suddenly feels a lot less comfortable. The stark truth is that Arsenal have lost to each of Manchester United, City and Chelsea this season. Beating the likes of Spurs and Liverpool is one thing, but that titanic trio provide the real acid test. Arsenal will need to win their home games against their closest rivals if they are to stand a chance of lasting the pace. I was chatting away to Tim Stillman of Arseblog fame – two fish in unfamiliarly opulent waters. Suddenly, Tim’s eyes lit up. Someone was approaching us – someone Tim recognised and, judging by his widening smile, somewhat liked. I felt a hand on my back. I turned around. It’s not so much that Wenger can’t beat Mourinho — it’s that Mourinho is expert at finding ways to stop him. Our boss invariably sends his team out play the same way, whereas Mourinho will select a team specifically designed to nullify the opposition. It’s ugly, but it works. The stats back it up. “If you can’t win the match, don’t lose” is becoming something a mantra for Wenger. It started as a reaction to the defeat to Swansea last season, and was reinforced after Robert Lewandowski’s late winner for Dortmund a couple of months back. There was a palpable fear of losing in similar circumstances tonight. The fans cried out for changes, but Wenger stuck with XI he started with, anxious that an unnecessary switch might upset the rhythm and, crucially , the defensive balance of his team. In some ways it’s commendable, and shows Wenger’s growing pragmatism. However, at some stage Arsenal are going to have to gamble, and accept the risk of defeat. Too many draws could prove costly in such a tightly-contested league. Apart from in the Emirates Cup, all wins are worth three points. Some, however, feel a bit special. Maybe it’s because the win put us back on top, maybe it’s because we were under the cosh for so long, or maybe it’s just because it’s Christmas, but these points feel significant. I’ll dip in to my big bag of cliches to state that these are the sort of games that eventual champions win. I love seeing Mertesacker with the captain’s armband. For me, he is the team’s true leader, and he truly led by example at St. James’ Park with a dominating defensive display. His performance against Newcastle really cemented his transformation from giant mutant bambi to defensive rock. No side won more Premier League points than us. Unfortunately, titles are won between August and May rather than January and December, but it’s a great testament to our consistency. Arsene Wenger, the man who signed Mark Hateley for Monaco, has renewed his love affair with the powerful centre-forward. Emmanuel Adebayor, Marouane Chamakh and most recently Giroud have heralded a return to playing with a more traditional type of striker. And now, Arsenal have become dependent on it. We’ve been blessed to have Giroud fit and firing for most of this season and last, but it’s also made us strategically lazy. The Arsenal team have been fed a steady diet of Olivier Giroud for 18 months, and it appears to have significantly altered their palette. Give them Luis Suarez, and they’d probably he aiming balls at his head and chest, wondering why he couldn’t bring them down. Giroud is not just integral to our attacking shape. He practically is the attacking shape. Theo Walcott looked impressive as a target man. His finishing was a little off, but he showed great movement and a willingness to take on the physical elements of the role. On the admittedly limited evidence of the past two games, he’s a far better bet for the position than Lukas Podolski. I’ve tried to work out whose injury would hit the team harder. I’ve come up with a list of three: Wojciech Szczesny, Per Mertesacker, and Olivier Giroud. As important as players like Aaron Ramsey and Mesut Ozil might be, we have others capable of doing a similar job. Walcott offers something special: goals. The season might be over for Theo, but it’s not for Arsenal. Arsene Wenger must act fast to ensure that the rupture of Walcott’s ligament does not also precipitate the tearing up of Arsenal’s title dreams. Sorry to disappoint, but I don’t see the Draxler deal happening in the January window. A lot of amateur body language experts have come out of the woodwork to analyse Arsene’s various smirks and batting eyelashes, but I don’t think there’s anything in there to suggest we’re on the verge of a swoop for the prodigiously-talented Draxler. Apart from a seven minute spell at the start of the second half, we were all over the place. The most worrying development was the return of a genuine sense of chaos in our play. On other occasions when we’ve dropped points this season, the machine has simply failed to function efficiently. Against Southampton, the machine went haywire. Nothing really seemed to work. Conceding a goal immediately after taking the lead is particularly concerning: that sort of sloppiness is unlike the Arsenal defence we’ve come to appreciate in 2013/14. This is my first opportunity to talk about the Kallstrom deal. Arsenal really needed a striker in this window, yet Arsene insisted there was no-one of the “super quality” required available. I’m not convinced we necessarily needed a midfielder, and yet he brought in one of dubious calibre who is injured.It’s a funny one. But he’s proved me wrong before. I, like many, has my doubts about the acquisition of Mathieu Flamini. I’d love to be similarly wrong again. The Emirates wasn’t much different. We weren’t dominated by United, but nor did we shed our insecurities. We had an opportunity to put them to the sword, but we looked more worried about dropping our shield. We’re as scared of Fergie’s ghost as David Moyes is. In isolation, a draw at Stoke is a decent result. However, this game was not played in isolation. It was played in the context of a title race, and all our other results. A draw would not have been good enough, and a defeat is a disaster.I know Stoke’s not an easy place to go. However, when we dropped points at home to United, it effectively narrowed the margin for potential error. Some hailed that as a good result “in isolation”. I wonder if they still think so now. It’s an unpleasantly familiar sensation, much like the one we found ourselves in at this stage 2011’s Carling Cup.Surely, the lessons of that disastrous final have been learnt. We’re more experienced, more determined and more professional. We ought to do it. There are no excuses. I don’t think Arsene is perfect. He’s arrogant, occasionally myopic, and infuriatingly stubborn. He’s human. However, as humans go, he’s pretty special.The longer his contract remains unsigned, the greater the chance of him walking away at the end of the season. Arsenal fans are being made to contemplate the daunting prospect of a team without Wenger at the helm.Let’s enjoy him while he’s here, and honour him as he deserves. It was sickening but not surprising. Arsenal have collapsed in each of their three games away to Manchester City, Liverpool and Chelsea, conceding a remarkable 17 goals along the way. We’ve only conceded 34 goals this season, meaning half that tally has come in our three most important games. Each of those games was seen as vital in our bid for the title. Each of those games took place at 12.45 on a Saturday. And each of those games saw us effectively surrender in the first quarter. Across the fixtures, we conspired to concede seven goals in the opening 20 minutes. It can’t be just coincidence. Something is deeply wrong. Arsenal have now won just three of their last eight games. Three times this season we’ve faced a supposed “Death Run”, and it’s difficult to argue we’ve come out of any of those periods well. On Friday, Wenger spoke with confidence about the prospect of signing a new deal at Arsenal. One wonders if a result like this might give him cause for reconsideration. On the biggest stages, his team continue to freeze. The spate of new contracts suggest a full recast is unlikely. To continue the theatrical analogy, the simplest thing might be to change the director. Wenger is intelligent and self-aware. If we can see his problems, the chances are he can too. His last eight years at Arsenal have been characterised by his selfless sense of duty. Perhaps his final selfless act will be to recognise a new man may be required to fix some of the underlying problems in this team. With Everton making good ground behind us, all focus is on securing a top four finish. It’s a somewhat depressing reality at the end of an exciting season, but fortunately we still have the carrot of a potential FA Cup win dangling ahead of us. Without that, the fans would be in full-blown meltdown. The operative *it* in this instance is the reign of Arsene Wenger. After this latest capitulation, serious questions have to be asked about his suitability to take the team in to next season — regardless of what happens between now and May. Truth be told, I happen to think we’ll make the top four. Call me crazy, but I still think we’ll win the FA Cup too. But that doesn’t assuage all my fears about the manager. If Wenger loses the FA Cup semi-final next week, it’s indisputably over. Even if he wins the competition, it may be more of a celebratory send-off than cause for a new contract. It’s not over yet, but it feels like it’s accelerating towards a gloomy conclusion. I don’t like it. But I’m not as scared of it as some. I don’t know about you, but I remembered reaching an FA Cup final as a good deal more fun. Let’s focus on the positives: however shoddily, the job got done. A positive result in the final will vanquish any traumatic memories of the painful semi. In recent weeks, Arsenal have been criticised for a failure to grind out results on the big stage. Yesterday, they managed exactly that. A penalty shootout is a test of technique. However, it’s also a test of nerve. It was to my considerable surprise that Arsenal passed that particular test with flying colours. Settled by the confidence and competence of Lukasz Fabianski, our takers executed their kicks perfectly. We’ve waited nine years for this. Think of what you’ve done in the last nine years. Ponder what’s changed since. 2005 was the year Youtube was launched. Lance Armstrong retired a champion, not a cheat. Twitter didn’t even exist. A cup nine years in the winning. A party nine years in the making. A blog nine years in the writing. The wait is over. Arsenal have a trophy again. And it feels fantastic. Arsenal is about a lot of things — I’ve already alluded to the amazing community that surrounds our club. However, a look at our story tells you it’s also about glory. It’s about history. It’s about transitory moments of elation that create indelible memories. That’s what we achieved at Wembley, and it’s what we ought to be constantly chasing. Sometimes, it’s seemed like the board had forgotten what that felt like. Maybe the manager, too. Time — and a shifting of priorities — had dulled their memory of the euphoria victory can invoke. A good deal of the players simply didn’t know any better: it wasn’t a sensation they were familiar with — until now. Now they know what the prize feels like. They know what they’re playing for. They know what it is to be winners. You can only hope the’ve got the taste for it. I know I have. So there you have it. Amazing to see how opinion vacillates and optimism waxes and wanes across the season. I’d love to say it’l give me a new sense of dispassionate perspective heading in to 2014/15, but that seems improbable. Bring on another rollercoaster.